2 months to grow, flower and mature, producing exceptionally strong medical grade marijuana buds. Jack Herer marijuana was originally created during the 1980’s by Sensi Seed Bank in Amsterdam. A Sativa dominant strain combining a Haze with three different types of Indica; Shiva, Skunk and Northern Lights #5. Named after the America cannabis activist, Jack Herer is a popular and respected form of medical marijuana with a variety of uses. Stabilized and feminized, each Jack Herer autoflowering seed is guaranteed to produce the highest quality plant in the shortest possible time. Autoflowering strains produce their best yields when subjected to the maximum number of light hours possible. Their ability to grow, flower and mature simultaneously reduces the time from seedling to complete maturity to the bare minimum. Once germinated and established as seedlings, Jack Herer autoflowering plants develop quickly, combining the growing and flowering stages together. The result is a dense, compact plant of around a meter tall that needs little care or attention to produce the highest quality buds. Indoor yields average approximately 5 ounces per square meter, while outdoors, 5 ounces per plant is common. The combined growing and flowering phases results in Jack Herer autoflowering seeds requiring between 8-9 weeks to fully develop and mature from their seedling stage. Planted outdoors from the beginning of the growing season, several high quality harvests per year can easily be grown in the same area, all with the same spicy-pine flavor and therapeutic relaxing properties as traditional buds from feminized seeds..
Jack Herer is a very popular form of medicinal marijuana, well-known for reducing stress and anxiety. Often prescribed as a day-time smoke, it can help to reduce fatigue, leaving the user feeling relaxed and energized for the day ahead. THC levels of approximately 20% ensure a fast, long-lasting high, while the 0.2% CBD content ensures a balanced effect, perfect for both recreational and medical use. 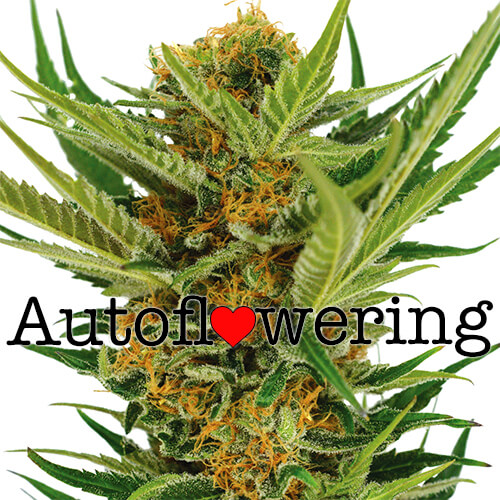 Autoflowering seeds are the perfect choice for fast harvests during the growing season. Their easy to grow characteristics make them highly popular with secretive ‘guerrilla growers’ in parts of the world where marijuana cultivation is prohibited. Jack Herer autoflowering seeds are of the highest quality and available now in packs of 5, 10 and 25 seeds, all sold with guaranteed delivery and germination. 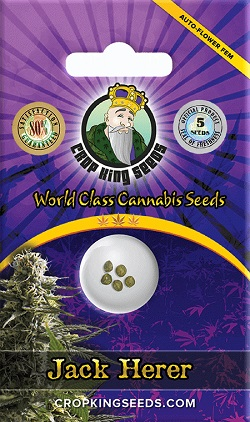 Buy Jack Herer Autoflower Seeds today and receive fast discreet shipping to Canada and all US states.